The Black Widow incorporates2 EL84 power tubes and 4 preamp gain stages for a thick and full overdrive tone. The preamp is equipped with a drive and gain control along with a three band EQ to provide a wide range of control over the tone. A presence control allows for even greater control over the tone shaping abilities of this amp. A fully bypassable effects loop is installed for incorporating external effects and pedals into the amps signal path. At around 18 watts, the Black Widow won't blow your head off but it will push a 2x12 cabinet with ease and is perfect for the home studio or bedroom musician. ​The Black Widows tone ranges from a smooth clean sound to a thick crunchy overdrive when the gain and drive are pushed to the max. All models can be built with either hardwood or tolex covering along with optional LED'S and grill types. Check out some of the other designs for more examples and options. Hello, thought I would start out with an amp review. I’m reviewing an amp made by Juicy Amps. This amp was tested with a Jackson Soloist with EMG 85 and a 2x12 cabinet loaded with Celestion Vintage 30s. First of all the amp looks very nice. 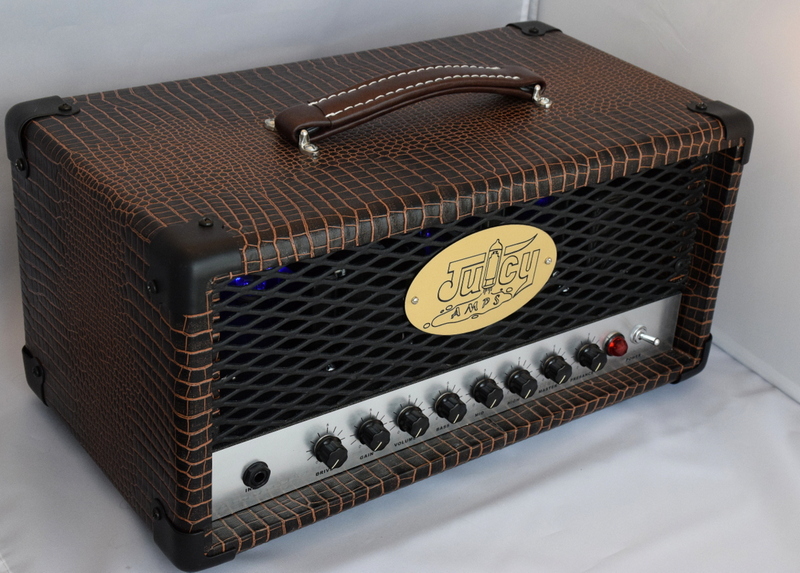 Juicy makes amps with wood finishes and Tolex. 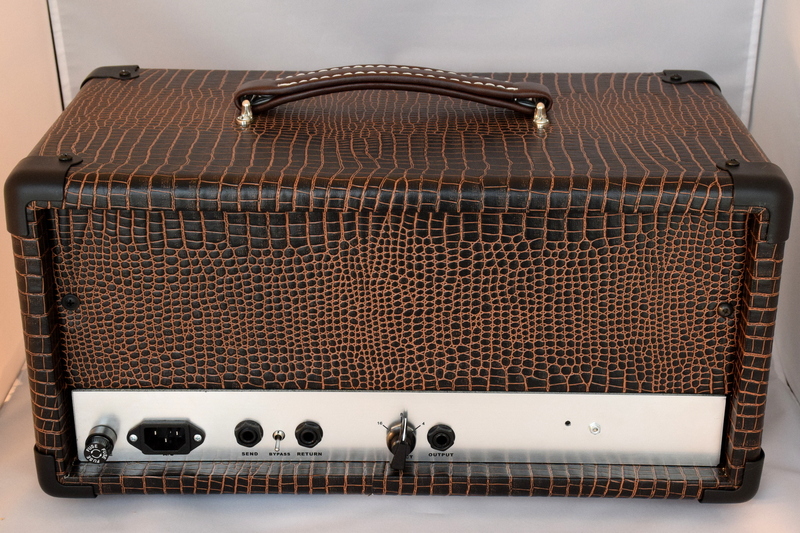 This model had the snake skin tolex and I have to say it looked very nice. The amp is very solid and cosmetically perfect. I started out just plugging the Jackson straight into the head. The head had very responsive tone controls that allowed a wide range of adjustment. Within seconds I was able to dial in a very nice tone. The gain adjustment responded very well. There is a wide range of gain from clean to vintage to overdriven metal. I personally have been more into a King Diamond/Merciful Fate type of gain lately and this amp covered that perfectly. With the amp set up in this fashion, the distortion was nice without burying the details and character of the guitar. Don’t get me wrong though, amp had plenty of gain to spare and could easily handle the heaviest of sounds. The amp also responded very well when set up a little dirty and then using a Boss DS-1 or SD-1. The thing that impressed me the most was the tightness of this amp. It seemed to be as tight as a solid state amp. This would be a great amp for chugging some low end riffage. 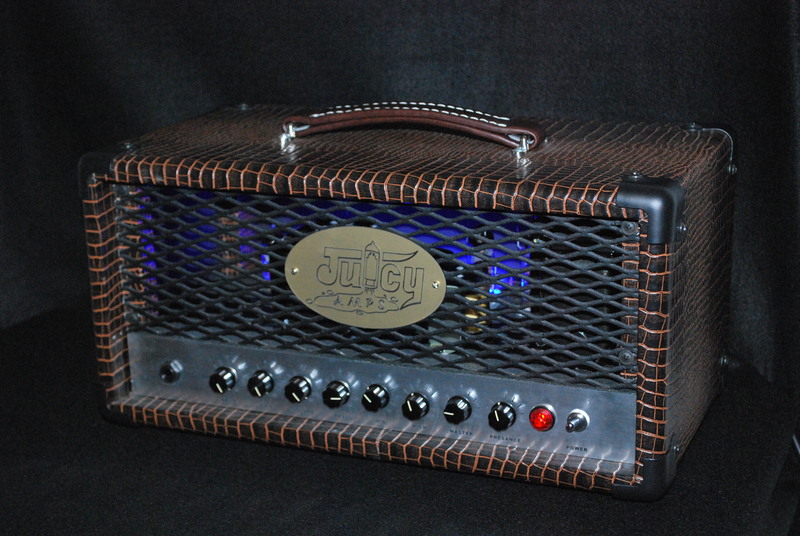 The Black widow is one of many newly designed guitar amps by Juicy Amplification that incorporates modern day design techniques with an old school, hand wired layout. The main objective of these amps is to combine the durability and sonic performance of a hand wired Boutique amps and incorporate those design techniques with modern day high gain pre amp topologies. The Black Widow is powered by 2 el84 power tubes and a medium to high gain preamp that can cleanup quite nicely. The el84's have a bright yet smooth sound with a strong mid range and a even amount of low end that is great for country, rock and metal alike. With separate drive and gain controls, the player can get smooth glassy clean to full blown distortion. At around 18 watts, this amp is perfect for the studio and small stage alike. All components are of the highest quality. Hammond Transformers, Mallory 150 capacitors, all metal oxide resistors, Belton tube sockets, JJ tubes, Neutrik connectors and high quality PVC coated wire. A series effects loop with true bypass is also installed for further flexibility and all preamp tubes are powered with a DC heater supply for low noise performance. LED lights and Alligator skin tolex are also installed for a more modern appeal. All amps are custom built for each player and each one is truly one of a kind. 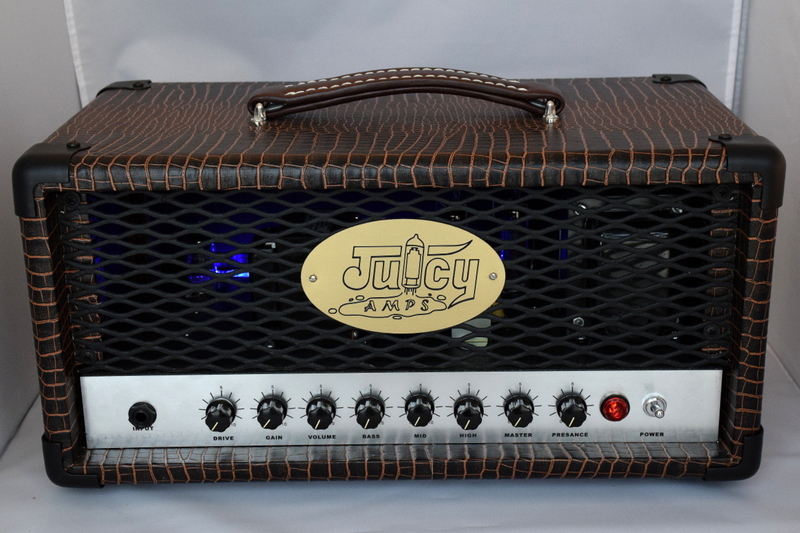 Look for more models to come from Juicy Amplification.